Omaha, Nebraska – November 1, 2017 – AgilityHealth, the leading Agile Measurement and Organizational Growth platform, announces the release of TeamHealth 2.0 and the Growth Portal. The popular TeamHealth radar has been enriched with TeamHealth 2.0 questions which follow the Crawl, Walk, Run, Fly maturity model based on feedback from TeamHealth users and a myriad of Agile experts. “We love our customers and respect our industry colleagues deeply, and we’ve been listening to their voices, the new TeamHealth 2.0 questions will provide more structure for teams when answering the questions and lead to less subjective results.” said Sally Elatta, president of Agile Transformations, Inc. The Growth Portal offers organizations an intuitive, straight-forward knowledge base by which individuals and teams improve their competencies and grow their Agile maturity, especially for larger enterprises with hundreds of teams and not enough coaching capacity. Developed by experienced Agile coaches, AgilityHealth customers, partners and under the guidance of the most seasoned practitioners in the community, this platform allows teams to leverage the results of their TeamHealth retrospectives. As a result, they can then see where they are now, decide where they want to go, and use multiple resources from the Growth Portal to highlight what they need to do to get there. Elatta’s reputation within the Agile community garnered her access to some of the best, most critical thinkers available. The extended team collaborated closely with members of the Agile community to ensure the release provides pinpointed, beneficial guidance to users. This guidance includes best practices, improvement tips, helpful downloadable resources, videos focused on Agile concepts and strategies, as well as opportunities to request help from internal or external coaches. 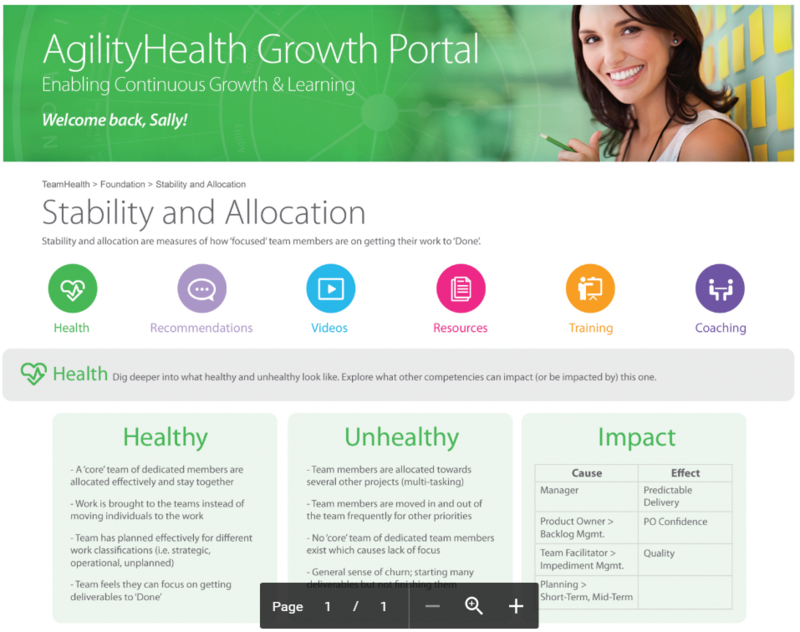 These enhancements to AgilityHealth will benefit all organizations to understand not only the health of their teams, but also how to grow and improve performance. Growth Portals for additional AgilityHealth radars are planned in the near future along with AI and predictive analytics capabilities to help teams and organization find the next best action to take to improve and grow. AgilityHealth is the leading Agile Measurement and Organizational Growth platform designed for companies scaling the adoption of Agile and Lean methods. Designed by real world Agile experts, it offers several radars to help measure and optimize the health of an organization. AgilityHealth provides a consistent way for measuring both quantitative and qualitative metrics for teams, programs, portfolios and the overall Enterprise health and business agility. It drives improvement and growth at each level of the organization and aims to engage leaders in this continuous growth process. Founded in 2009, Agile Transformation, Inc. strives to help executives and leaders succeed with Enterprise Business Agility transformations and build healthy high-performing teams. Agile Transformation, Inc. helps guide the process through defining a strategy, providing coaching and training workshops and enabling measurement of results via AgilityHealthⓇ. Agile Transformation also provides the largest Agile eLearning library at http://www.AgileVideos.com, to scale and sustain learning across the enterprise.